The Buzzer blog » I Love Transit 2014: Your painting, cake, crossword, poem, letters, song, and video! 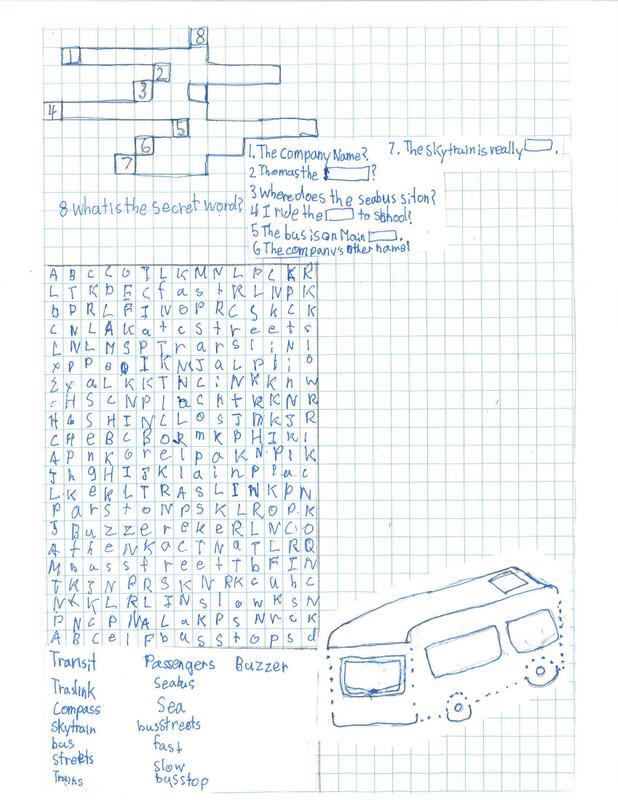 I Love Transit 2014: Your painting, cake, crossword, poem, letters, song, and video! It’s I Love Transit Week and what makes this week so special are the riders sharing their transit with love us. We received many submissions, but here are some of our favourites! Check it out! While living in New York City, Denise and I annually flew west to spend the Christmas Holidays with her family in Burnaby. One balmy December day I walked to Central Park. The sky was clear and brisk; the temperature not quite nippy. There I saw the SkyTrain structure; I thought it a handsome design and made a pen and ink sketch. After returning home I painted from the sketch. Taking artistic license, I changed the season to somewhere between spring, summer and fall. A Mark I SkyTrain cake! Looking for some crossword puzzle fun? Give Matthew’s a try! Poetry in Transit by William F.
So ride the bus everyone! Annette visited Metro Vancouver from Australia and she sent this in. I am writing to compliment you on your transit service. In April-May 2014 I visited Vancouver, along with my husband and a friend. We used the transit system extensively during that time (bus, SkyTrain and SeaBus). We found your transit system easy to use from a visitor’s point of view, as well as being efficient. We were able to get to our destinations relatively quickly and easily. Your fares are also well priced (compared to those here in Australia). We mainly used your DayPasses, which we felt were very cost effective. So a big thank you from me. Please keep up the good work. Many thanks. Rod was reading The Buzzer while travelling on the 106 from New Westminster to the Tommy Douglas Library near Edmonds and Kingsway. He submitted us this song he wrote several years ago about a love he met on the 135 bus. It was arranged, composed, produced by Pim Bouwens of Sam’s Falling. Richard sent this one in of his West Coast Express train set! If you have other things you’d like to share with us, feel free to send it to thebuzzer@translink.ca. We’d love to see it! I Love Transit Week 2010: transit haiku on our TV ad screens! I Love Transit 2013: A new day of Metro Vancouver transit activity video!